A three year old naturally becomes more and more independent of mom as the year goes on. The three year old can move with more ease and fewer falls. A three year old can start to draw pictures and get undressed and dressed alone. It is an exciting time! But also a nerve-wracking time. Just like Peter Pan, these little ones often find themselves fighting against the idea of growing up. Brinley emphatically insisted she would never be anything other than three again. Also like Peter Pan, these three year olds have an imagination that is unbridled. They live in an enchanted state where deem themselves to be good at everything and can imagine whatever world they want to exist. They are carefree for the most part and literally stop to smell the roses often. 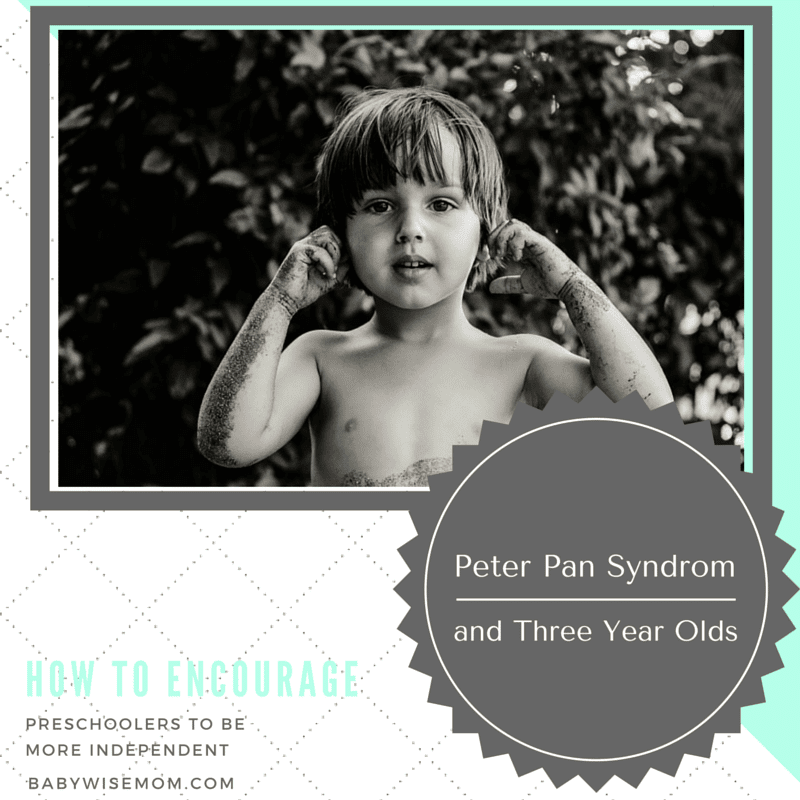 But of course Peter Pan wasn’t just all fun and games, and neither are three year olds. Every so often, Peter found himself at Wendy’s window to listen to stories. There was a draw to this motherly figure of Wendy and this responsible life the Banks children lived. 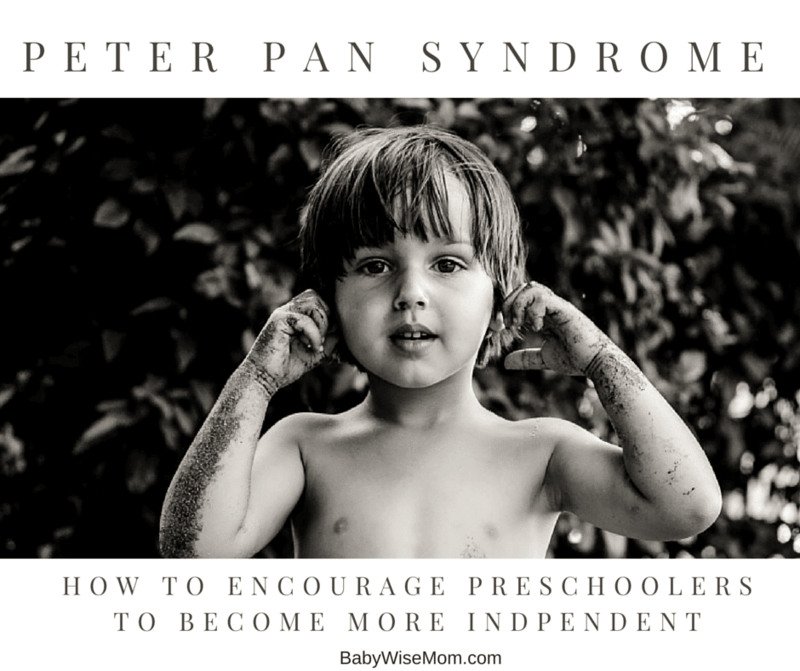 In a similar manner, three year olds have a draw to taking on more responsibility. They don’t want to grow up necessarily, but they do want the privileges that come with growing up. There is a sense of accomplishment that comes with the skills a three year old develops, and it makes them feel good to reach those milestones. You might also be thinking, “My child does not fight against growing up.” An oldest child often won’t show as much resistance to the growing up. In fact, an oldest might try to grow up too quickly. There can still be anxiety over the growing up process, however. Back to what you do about it. That is a funny phrase coming from a three year old. Instead of saying push, let’s say “encourage.” Here is an example. A standard milestone a three year old should reach is the ability to dress and undress herself. Brinley has naturally done most of this step on her own by virtue of loving to play dress up. There is one area she was not getting, and that was taking a t-shirt type of shirt off by herself. She couldn’t do it and she refused to try. I didn’t push it for a long time, but she is two months shy of four and it is really time she just do it. One day recently I told her she needed to take her shirt off by herself. She got the drama face on and said she couldn’t do it. I assured her she could. I talked her through it. She was dramatic about it the whole way through, but as soon as she got it off, she burst into giggles and was so pleased with herself! So I didn’t push her to just become a big girl all at once. I let her warm up to the idea. I let her request certain things. And there were other things I have had to push. This might seem like letting the child parent, but we are talking about a three year old not wanting to grow up too quickly. You can take things slowly and let the child grow to accept and even embrace the idea of being a big kid. How do you do that? You get children excited about accepting growing up by pointing out the privileges that come with being a big kid. Oldest children inherently recognize those privileges and usually want to be like their parents, anyway. That is why you often don’t have trouble talking an oldest into embracing “big kid” tasks. You usually have to talk them into holding on to childhood longer. Do not allow your child the privileges that come with taking on more responsibility without taking on the responsibilities. Is it harder to take your shirt off by yourself? Yes. More effort is extended that way. So your child might not have motivation to do it. A huge part of learning a new skill is making mistakes. There will be many spills, for example, when the big kid cup first comes out. Be smart about how much liquid you put in the cup. You might even start with just water at first. Be patient with the mistakes and mishaps as they come. If you make a big deal over them, your child can become hesitant to take on new tasks for fear of you getting upset when the inevitable mistake happens.